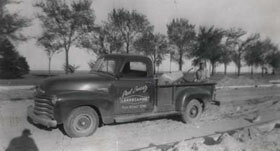 In 1949 Paul Swartz, utilizing his grandfather’s knowledge and skill in the business, started his own nursery near Wilmot, Wisconsin. Beginning with an old Ford pickup truck and a wheelbarrow, Paul slowly expanded his business with an emphasis on personalized landscape designs, quality nursery stock, and the dependable service that our clients have come to expect from us. Paul Swartz Nursery is now run by Ross and Elizabeth Swartz and employs experienced landscape designers, landscape crews, and other knowledgeable field personnel who work together to produce quality plants and dependable service for our customers. We are eager to continue providing both our new and established customers with the finest in landscape development.